As one of the world's leading suppliers of gene synthesis services, GenScript has a proven record of dedication to innovation in our constant efforts to integrate new and updated technology into our gene expression repertoire. 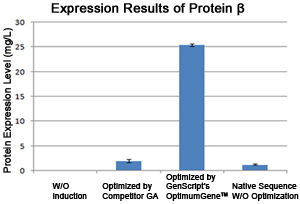 GenScript's OptimumGene™ Gene Design system is a proprietary PSO-based gene optimization technology that can alter both naturally occurring and recombinant gene sequences to achieve the highest possible levels of productivity in any given expression system. 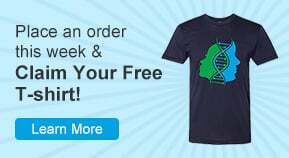 Learn all about how codon optimization can be implemented in your research today! 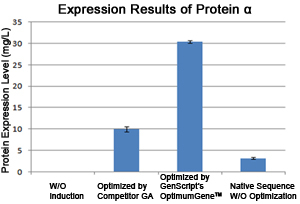 While other gene platforms focus solely on codon usage tables when optimizing genes, the OptimumGene™ PSO algorithm takes into consideration a variety of critical factors involved in different stages of protein expression, such as codon adaptability, mRNA structure, and various cis-elements in transcription and translation. This allows our proprietary platform to provide the ideal sequence for maximum protein expression in any host. DNA vaccine design: GenScript provides effective solutions to your vaccine needs, such as screening and optimizing parameters involved in regulating vaccinal gene expression and immunogenicity.